1 of 1 Heat grill or broiler. 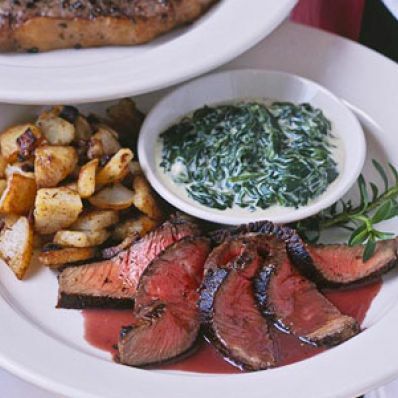 1 of 1 In resealable plastic food-storage bag or glass dish, combine red wine and sirloin; seal bag. Marinate steak at room temperature for 15 minutes. Remove sirloin from bag. Season on both sides with salt and pepper. 1 of 3 Meanwhile, in small saucepan, whisk together wine, broth, mustard, sugar, onion powder, salt and pepper. Bring to simmering over medium-high; simmer until reduced to about 1-1/4 cups, 20 minutes. 2 of 3 Grill or broil sirloin for 3 to 5 minutes, depending on thickness. Flip steak over; grill another 3 to 5 minutes or until internal temperature registers 145 degrees F on instant-read thermometer for medium-rare. Transfer to cutting board; let stand 5 minutes. 3 of 3 Stir flour-water mixture into red wine sauce; simmer until thickened, about 3 minutes. 1 of 1 Cut sirloin across grain into thin slices. Drizzle with red wine sauce. Serve warm. Makes 4 servings. Per Serving: 711 mg sodium, 0 g fiber, 4 g sat. fat, 5 g carb., 40 g pro., 115 mg chol., 11 g Fat, total, 298 kcal cal.